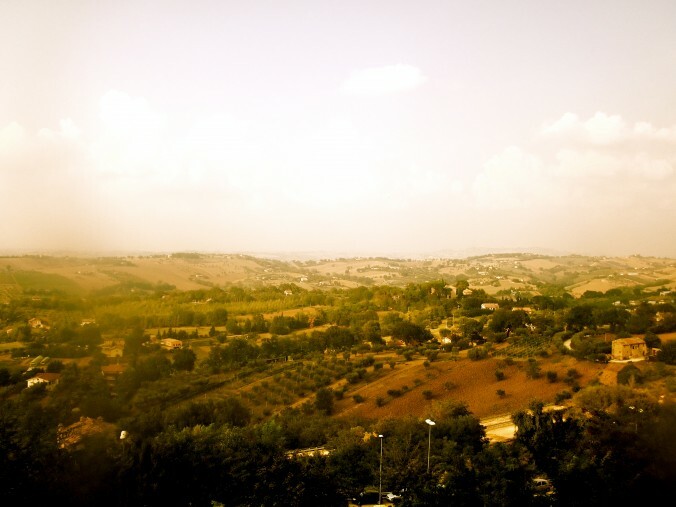 My time in Macerata, Italy is most strongly characterized by the food I ate—fitting, since I was studying food, culture, and the environmental and ethical dilemmas associated with them. My fondest memories are not only because of the culture and history behind the meals, or even their quality and contents; most importantly, I know I will always remember who I ate them with, and all of the different people I met because of food. My experience in Italy truly showed me how powerful food is in cementing social bonds; whether the meal was in my apartment with my roommates, starving after our day of environmental studies and Italian art and architecture classes, at the coast eating a seafood meal caught by local fishermen, or olive oil and wine tasting after class. All of my memories I cherish, however, one especially valuable experience was at a family owned restaurant that was full of character, called Trattoria da Ezio, where I learned to make pasta from scratch from an eccentric Italian grandmother. Mirella, the owner of Trattoria, is an older woman full of character; she is exactly how one would imagine a spirited Italian grandmother to be, full of life, jokes, and an intense passion for quality, delicious foods. I loved the family aspect of the restaurant; Mirella’s father, her son Marco, and Marco’s brother all work there. It was pretty cool to see them in action, and to see how they interact with each other in the kitchen. This family run type of business is becoming rarer in present day society, but I think it is so valuable and truly adds character to a business. Mirella and Marco were the instructors of our lesson in making pasta from scratch; they made the process look simple, but, like any skill, practice is necessary to perfect it. Mirella emphasized that we should only use fresh eggs; supermarket eggs will not suffice. The eggs we were given were local, and the yolks were brighter than any I have seen. They were bright orange, and resembled the color of a sunset. The ingredients for fresh pasta are very simple; flour, eggs, and a dash of olive oil. It’s a cheap meal to make and fairly easy, making it a perfect dish for college students or people looking to eat economically. She is so accustomed to the recipe that when she cooks, exact measurements are not necessary. Although she did not measure anything out, 100 grams of flour is necessary for one egg and this amount makes one serving of pasta. She placed a handful of flour in front of each of us, and made a well with her fist to crack an egg in. We were then instructed to beat the egg into the flour using a fork, until both were incorporated enough to work the dough with our hands. Kneading the dough is the next step, and I worked to get a smooth, ball shape. Olive oil is then splashed on the dough to prevent sticking and to give the noodles flavor. Mirella scolded us often (in a loving way, of course) and yelled, “Farina! Farina!” when the dough was too moist. After kneading again to incorporate the oil, we used a rolling pin to flatten the dough. The goal is to create a thin, square or round shape. The thickness should be minimal; I would estimate around a quarter centimeter, so definitely as thin as possible without breaking the dough. However, I found that if there are a few holes or cracks, the pasta is not ruined, because when cutting the noodles out it is easy to avoid these imperfections. They don’t affect the end product. Flattening the dough out was the hardest part for me; it requires a surprising amount of strength and patience. After thinning the dough, it is supposed to rest for about an hour. After resting, the circle or square is rolled from opposite sides, making a scroll type shape. A knife is used to slice the roll into desired thickness. We made a pasta shape called “tagliatelle,” although a variety of noodle shapes can be made from the same dough such as angel hair and spaghetti. This dough is also a base for ravioli, tortellini, and lasagna noodles. After slicing the noodles, they are ready to boil. Fresh noodles only require a few minutes of boiling. Mirella said that directly after making the noodles, only 1 or 2 minutes is necessary, but since we brought our noodles home to cook, and I found I needed around 3 or 4 minutes since the dough had sat out longer than an hour. I loved being able to apply this experience to my educational studies; how making pasta the “old fashioned” method is one way to return to the land and improve the quality of food in our lives in America. It also inspired me to try new combinations after returning to Eugene. I would love to try and make pumpkin ravioli in the fall, gorgonzola and mushroom ravioli in the winter, and ravioli filled with pesto in the spring. Sauces and fillings can be seasonal; artichokes, mushrooms, tomatoes, basil and the addition of meats, too. You can make noodles into a comfort food such as lasagna, or prepare a thick, creamy gorgonzola sauce for homemade angel hair. It can be light and refreshing—a simple drizzle of olive oil, fresh slices of local heritage tomatoes, mozzarella, and spinach with tagliatelle. The ideas are endless, and that is what I love about cooking at home. It is such an outlet for creativity, and not only do I love eating things I make from scratch, but I love the joy it brings others, too. I feel so blessed to have this cooking experience in Italy. In my time there, my beliefs and values regarding food, food production, and its relationship with culture and the environment were cemented. I have realized that when deciding what one eats, consumers have to consider more than the nutritional content,. Eating ethically requires one to take into consideration where their food came from, the cultural context surrounding it, and who made or grew the product. Making fresh homemade pasta culminates these ideas perfectly, and it is exceptionally tastier than dried boxed pasta. It is unprocessed and healthier; it does not have any additives, it was made in an environmentally and ethically sound way, and as Mirella told us, it is made with love.